"The Pinky & Perky Show"
Creators of "Pinky & Perky"
Puppeteers Jan & Vlasta Dalibor came to the UK from Czechoslovakia in 1948. Jan spent his first three years in this country working as a coal miner, before launching their UK puppet career in 1951. The programme reproduced here is from their 1956 Summer Season at Heysham Head, near Morecambe, Lancashire - immediately prior to their first big television break. 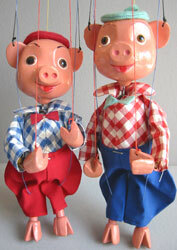 The two little pigs, later to become Television Superstars "Pinky & Perky" were included in the cast of marionettes for this Summer Season, but at the time, their star potential had not yet been realised and they were not even referred to in the programme. The 1956 season included on the bill: "In Crazy Mood" introducing Jerry & Terry, the Musical Clowns (they played French Horn and Accordion). "East Meets West" with Rajah Jam, the Snake Charmer and Slinky the Snake. "Little Prue's Party Piece" assisted by Professor Wurstschnitzel. "Bobby's Wildest Dream" featuring Mickey the Midge, Lucy the Ladybird, Silas Spider and Hoppy the Grasshopper. "A Peep into the Puppet Circus" with Charlie the Chimp, the Juggling Unicyclist and Busto the Baby Elephant. "Fish Pond Serenade" featuring Ernie, the one and only singing Bullfrog and Fifi the Fish. "Musical Rendezvous" with Max Moonface at the Piano. Later in 1956, the Dalibors had a guest spot on the BBC's "It's Up to You" which is when the two little pigs came into their own and in 1958, the first series of "Pinky & Perky" appeared on the BBC, followed by a further 9 years and then 4 years at ITV, taking them up to 1972. The characters of pigs were chosen because the pig is seen as a symbol of good luck in Czechoslovakia. The pigs were originally to be named Pinky & Porky, but because of a problem registering "Porky" as a character name, they instead became Pinky & Perky. 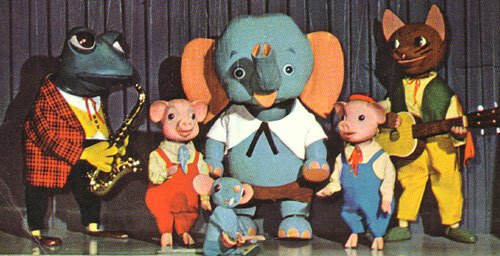 At the peak of their fame in the mid-1960s, 15 million viewers were watching each weekly half-hour episode of "The Pinky & Perky Show" and merchandise of every conceivable kind bore their image, including the very popular Pelham Puppets' versions of Pinky & Perky pictured here, which are still collectors items today. The Dalibors' marionettes were particularly finely constructed and were notable for the flair of their design, the like of which had not been seen before in the UK. The figures were very well suited to the close-up scrutiny of the TV camera. 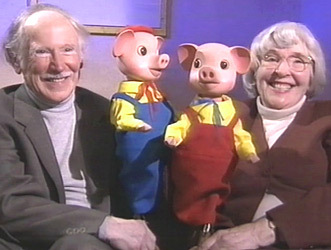 In addition to the two pig characters, the TV shows featured a great many other animal characters and the Dalibors were assisted by Philip & Elizabeth Rose as additional manipulators for the many marionettes which appeared on screen in the more than 200 episodes which were broadcast. In a BBC interview in the 1990s, Jan Dalibor recounted the story of a comment made to him by a former work colleague on the day he left the coal mines for the last time to pursue his puppetry career. "Jan, in ten years' time, you will be performing on Broadway." Everyone was laughing. It was a really big joke. But he was wrong, it took us only five years. Update Nov 2008: On Monday 3 November 2008, Pinky & Perky finally returned to Children's Television in a new series. This time minus their strings and with a completely new appearance.